Edvard Munch appeared pleased with his first series The Frieze of Life. Not only was it exhibited in Berlin in 1895, but it was shown again in Oslo later that year, and in Paris in 1897. He then left it for two years before adding works to detail transitions between its two major themes of love and death. Munch assembled his mature version, titled Frieze: Cycle of Moments from Life, and exhibited it in Berlin in 1902. It then consisted of twenty-two paintings, arranged in four sections, which I detail in this and the following articles in this series. The first of the four sections is titled Seeds of Love, and contains a sequence of six paintings which were arranged on the left wall of the room. The Boston version of Summer Night’s Dream (The Voice) (1893), included in the 1895 version of the Frieze, was here titled Evening Star. 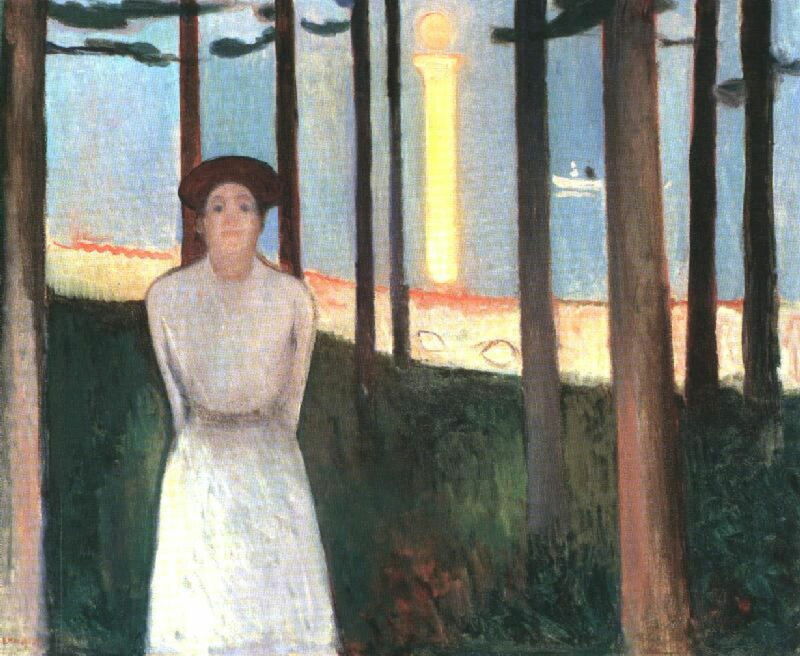 It shows Munch’s lover ‘Mrs Heiberg’ at the edge of the Borre Woods, to the north of Åsgårdstrand. Munch still preferred this over his second version of this painting (below), now in Oslo, which is cropped more closely and has additional boats on the fjord. Both versions feature a brilliant golden-yellow pillar of reflected moonlight on the fjord, but it is the Boston version in which it forms a distinctive ‘i‘ which reappears in other paintings. 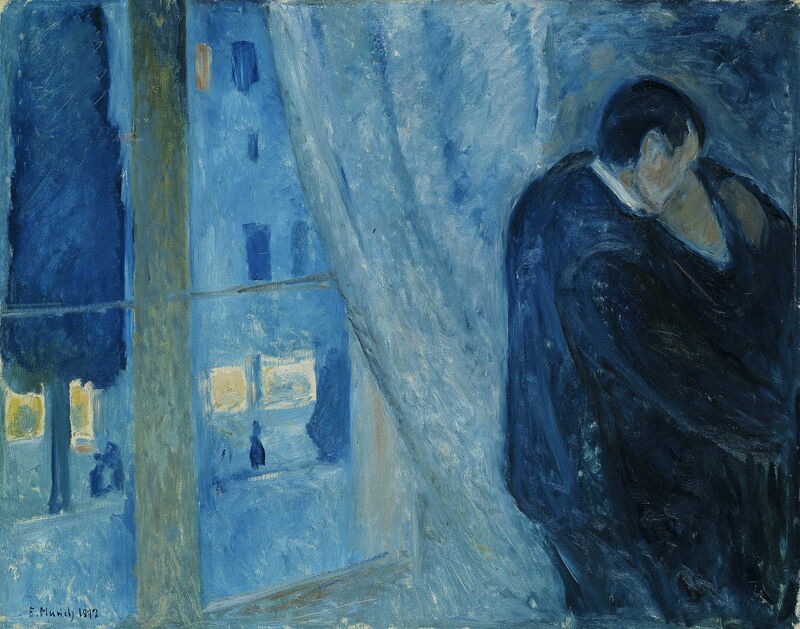 This work initiates the sequence in which Munch gives his personal account of the process of falling in love. 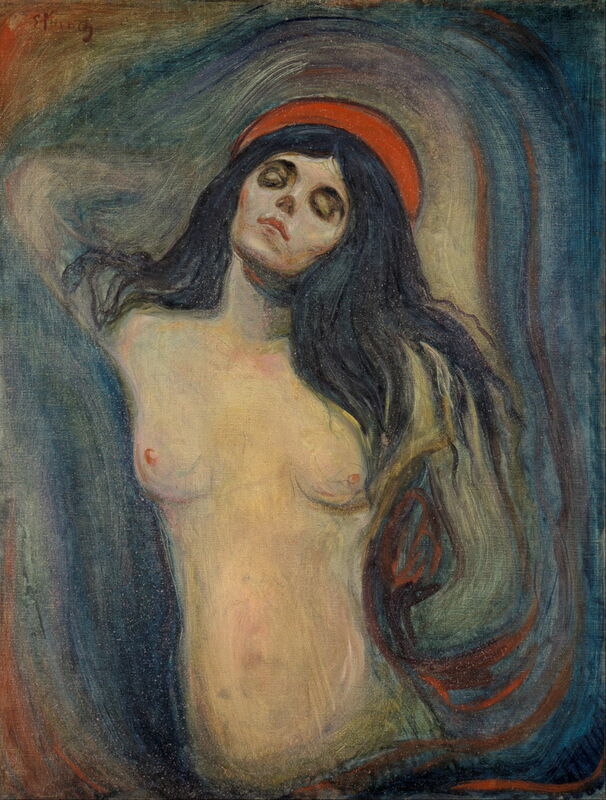 Although Munch had painted this in 1894, he did not include it in his Frieze until the second, 1902, version. 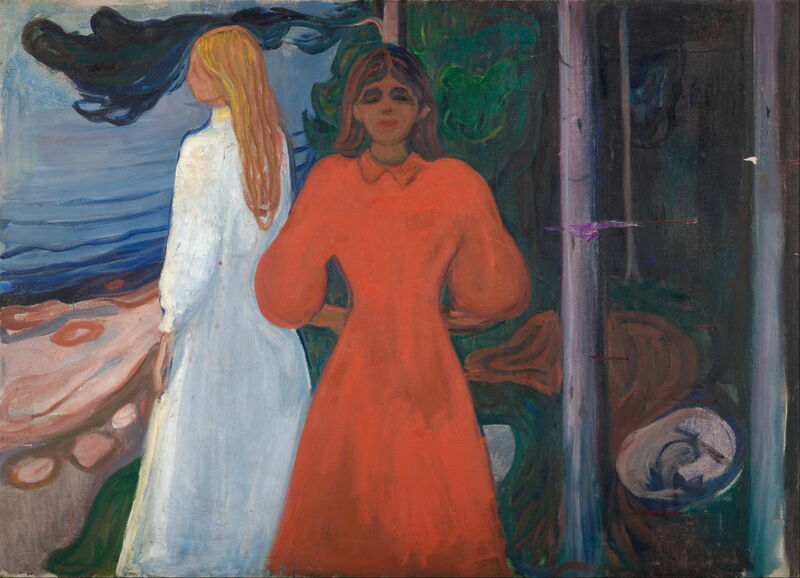 It shows two women: at the left, dressed in white and looking out into the fjord at Åsgårdstrand, and in the centre, dressed in red and looking directly at the viewer. At the right, in what is now shown as the depths of a pine wood, there is evidence of a third figure, which has been painted out. This motif is an introduction to the more complex composition of Sphinx (Woman in Three Stages), which appears later in the Frieze. Here it establishes the first two stages of woman: the ideal and innocent, and the mature and passionate. The woman in white is similar to the figure in The Voice, above, making this a link between initial innocence and later passion. These develop his narrative, and provide a reference mark to lead into the troubles of love. 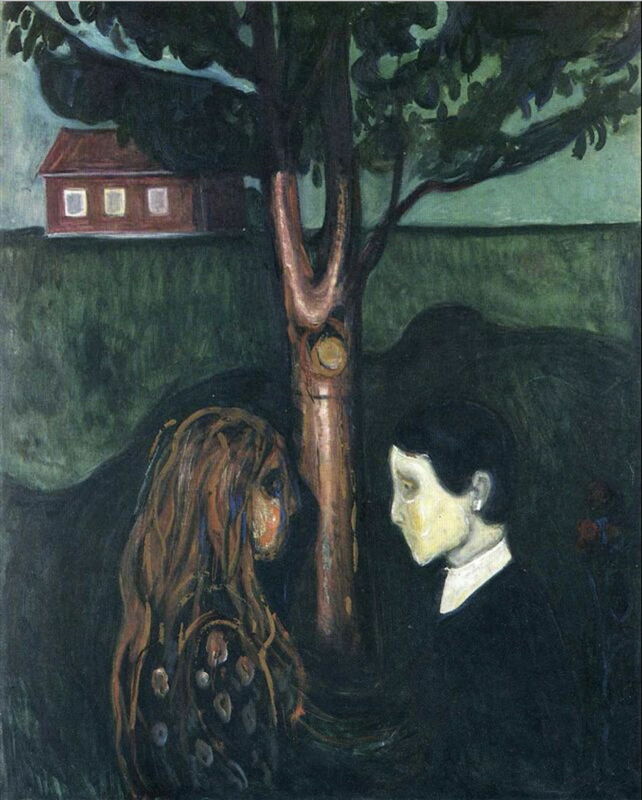 Munch had already used Eye in Eye (1894) to show a further step in the development of the relationship between a man and a woman. In the original version shown prior to about 1906, this work was probably more gloomy in its colours and tones. 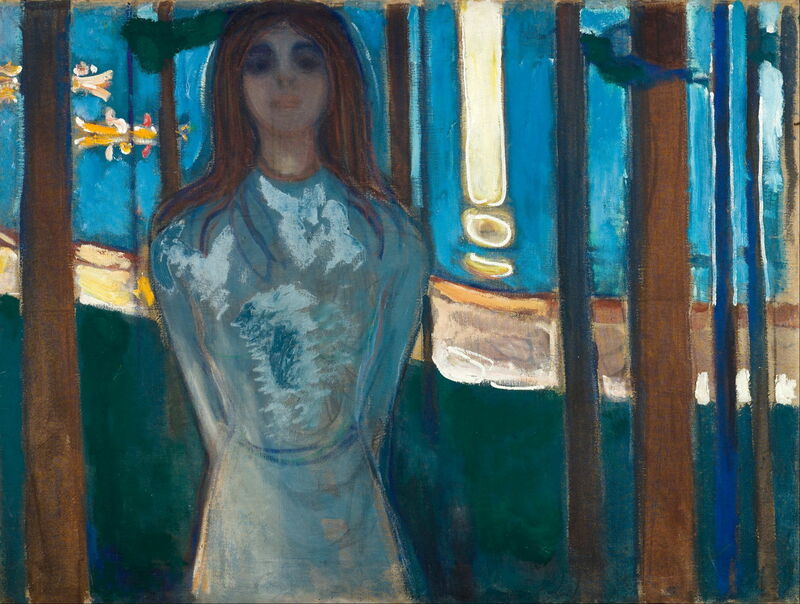 After 1906, Munch is believed to have overpainted the hair of the woman and the tree to add the bright highlights seen in its current state. Edvard Munch (1863–1944), Dance on the Beach (c 1900), oil on canvas, 96 × 98.5 cm, Národní galerie v Praze, Prague, The Czech Republic. Wikimedia Commons. 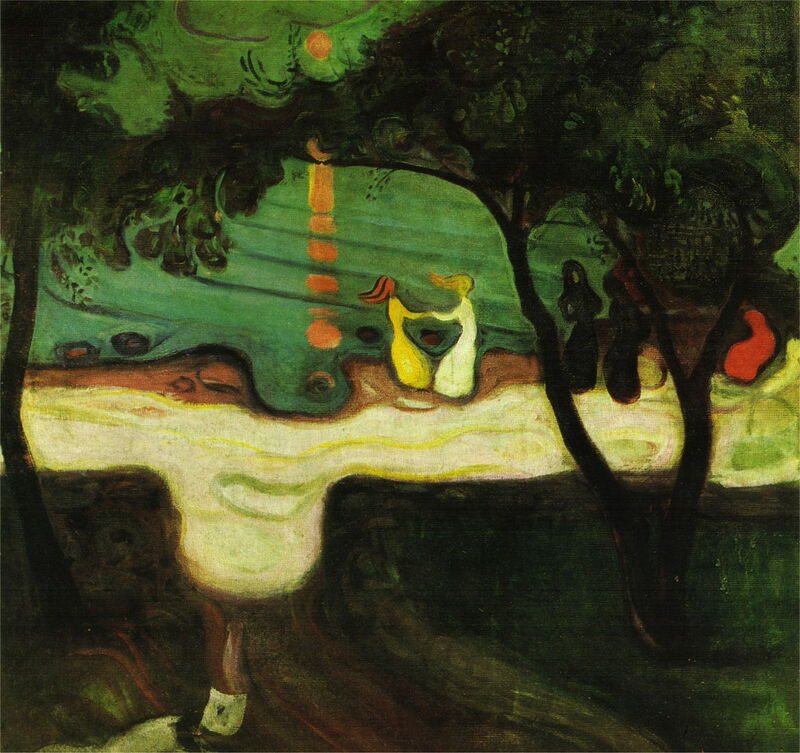 Dance on the Beach or Dance on the Shore (c 1900) was among the paintings made by Munch to enlarge and enhance his original Frieze to its 1902 form. It shows a dance taking place on the shore of a fjord, viewed from the shore, through the pines, much as in The Voice. This appears to be a simple, happy occasion featuring five different women, the colour of their dresses linking back to Red and White above, and forward to The Dance of Life in the next section of the Frieze. Later, in his panel Desire (1906-07) from the Reinhardt Frieze, Munch re-arranged the figures in a lighter and brighter setting, under the constant ‘i‘ of the moon and its reflection. The Kiss (1897), a later version of the painting also shown in his 1895 Frieze, is a close-cropped image in which the lovers dominate the canvas and fuse into a single form. This was derived from the earlier variant (below), painted by Munch during the winter of 1891-2 when he was at Nice, on the French Mediterranean coast. 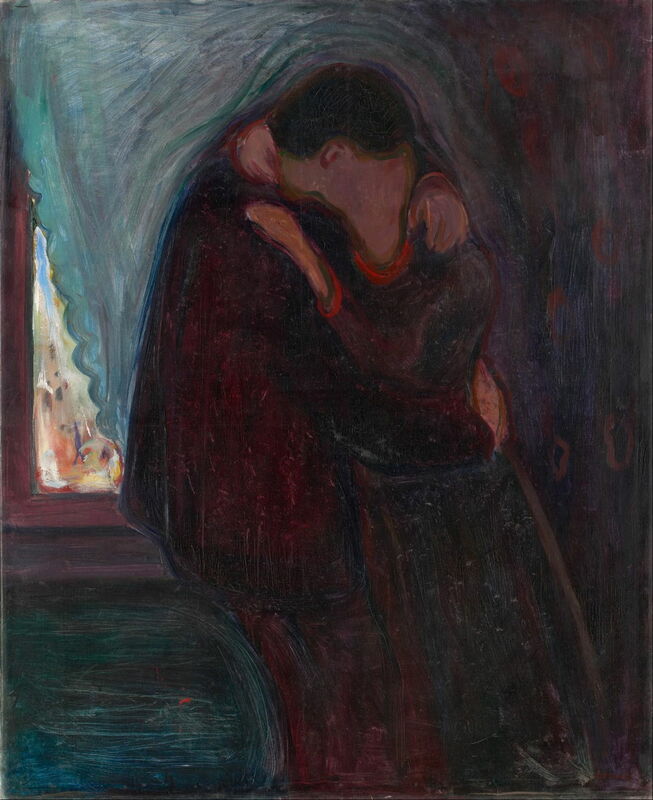 The later cropped motif became a recurrent image in Munch’s prints, such as The Kiss below. 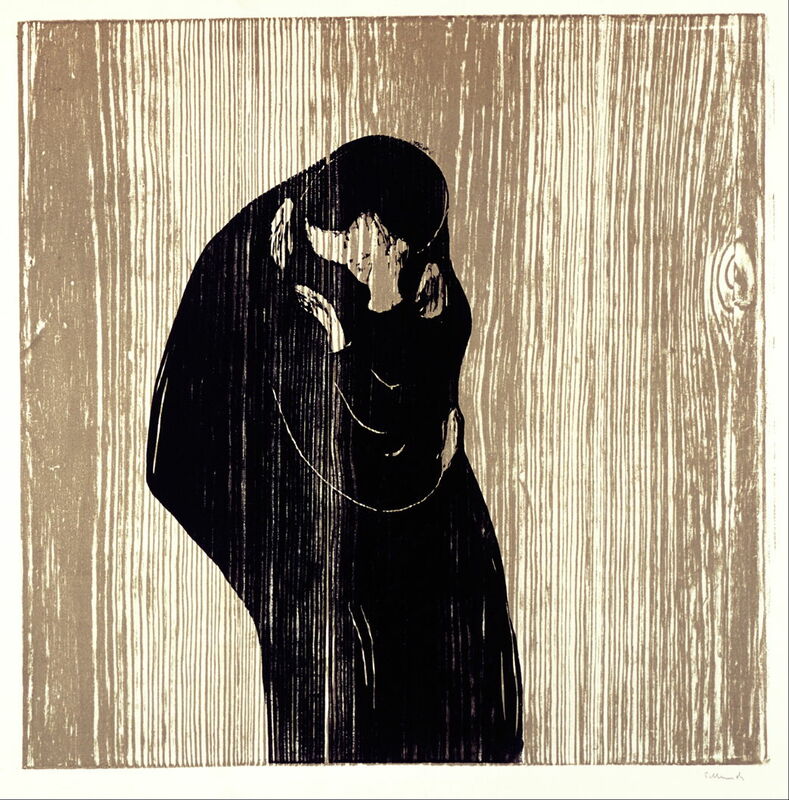 Edvard Munch (1863–1944), (The) Kiss (1902), woodcut, 47 × 77 cm, Munchmuseet, Oslo. Wikimedia Commons. The final painting in this opening section was Munch’s Madonna (1894). This provided the transition to the next section with its conflicting (and shocking) themes of saint, whore, and abandoned lover. His use of red as the colour for the halo is consistent with its interpretation of passion and earthy eroticism. In more conventional Christian religious art, these themes would normally have been reserved for depictions of Mary Magdalene. This led to the next section’s theme Flowering and Passing of Love.